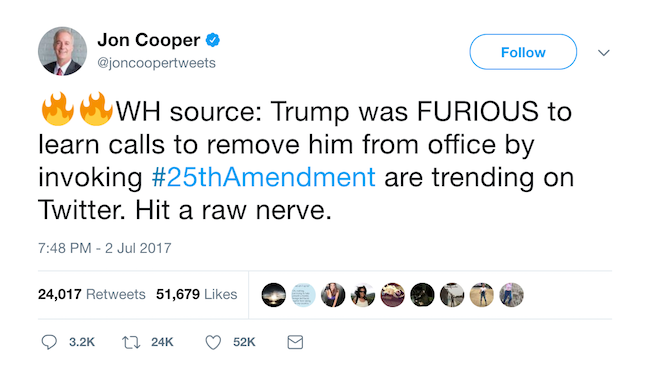 In the year of its 50th anniversary, the 25th Amendment is suddenly seeing a surge in relevance -- so much so that there are even reports of the White House itself taking notice. This has been precipitated, of course, by a recent bill sponsored by Democratic Rep. Jamie Raskin of Maryland, one that would create a congressional "oversight" commission which could declare President Donald Trump to be incapacitated under the 25th amendment and consequently remove him from office. As Raskin explained to Yahoo News, "In case of emergency, break glass. If you look at the record of things that have happened since January, it is truly a bizarre litany of events and outbursts." The 25th Amendment was ratified in the immediate aftermath of President John F. Kennedy's assassination, with the goal of providing a thorough outline for what should happen in the event that the president or vice president should be killed, incapacitated or resigns from their office. It was officially ratified on February 10, 1967. The section of the amendment that pertains to Raskin's bill states that "whenever the Vice President and a majority of either the principal of the executive departments, or of such other body as Congress may by law provide, transmit to the president pro tempore of the Senate and the speaker of the House of Representatives their written declaration that the President is unable to discharge the powers and duties of his office, the Vice President shall immediately assume the powers and duties of the office as acting President." Although no sitting president has been deemed incapable of running the country in this fashion, there have been recent presidents about whom scholars argue such a declaration could have been made. These include Woodrow Wilson, who suffered a debilitating stroke in 1919 (before the 25th amendment had been ratified), and Richard Nixon, who succumbed to severe alcoholism in 1973.